Many thanks to Random House of Canada for sending this marvelous novel; a story that I thoroughly enjoyed from beginning to final page. The Hungry Ghosts has everything you want in a smart read: marvelously intelligent characters, elegant prose and most of all, great wisdom. 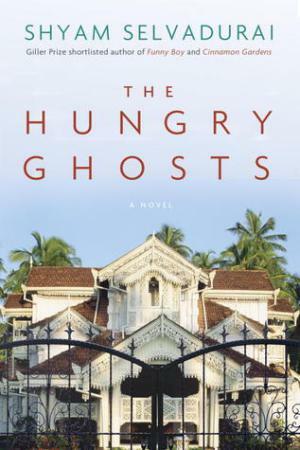 The Hungry Ghosts centers around Shivan Rassiah, a wonderful character in war-torn Sri Lanka, whose life becomes a wide open book for the reader. Shivan’s mother and sister live with him in his grandmother’s Colombo home at the novel’s start, which proves an impossibly uncomfortable situation. Shivan’s grandmother adores her beautiful grandson, and places him on a pedestal. Her love for him places everyone else in a dark shadow, and simultaneously drives an invisible wedge between Shivan, his mother and his sister. While the politics of his home country ravage communities and citizens, Shivan’s extraordinarily wealthy grandmother miraculously keeps her family safely tucked away. The reason for this emerges as the story progresses, and Shivan comes to discover her true character. Increased danger forces Shivan’s mother to move her little family to Canada, and they leave her mother (Shivan’s grandmother), behind in Sri Lanka. While aghast that they would leave, the grandmother supports the move financially. Life in Canada at the outset is not easy, and tensions grow for the struggling mother and children. Their little home is vastly different from the grandmother’s sprawling estate. The food is different. People are different. The culture is unrecognizable. Each of them must adapt in their own way. Picking up where he left off in Sri Lanka, Shivan becomes increasingly aware of who he is. His realization that he is gay at first stifles him with confusion, but in a wealth of self discovery, he embraces his true self. I have to say that Shivan is one of the most intriguing people that I’ve encountered in a novel. Truly, he is a beautiful character. He’s someone who slowly reveals his heart to the reader, and you just can’t shake the feeling that you’ve been given a remarkable gift of trust. And although Shivan’s new Canadian life is steadily moving forward, something continues to pull him home to his grandmother. His return to Colombo winds up being an extended stay, much to his mother’s dismay. Once back in the folds of his grandmother’s wealth, he begins to learn her business, and becomes well acquainted with her associates. Should he stay, and run her affairs? Is he made of the same material? As the source of her great wealth is revealed, is this life something that Shivan can stomach? Not only does Shivan become accustomed to life back in Sri Lanka, but he falls in love. Someone from his past reappears, and the two of them share a connection for which not even Shivan was prepared. As their relationship progresses, his grandmother’s power emerges, culminating into a life changing event for everyone involved. This portion of the novel is brilliantly written; it’s as impossible as it is heartbreaking. There’s just no way to stagger from that kind of situation without permanent scars, and Shivan brings those scars with him back to Canada. His pain leads to a move to the West Coast, where life returns to a certain degree of normalcy. What I found incredibly pronounced, however, was the emotional tether that Shivan still had to his grandmother. Her ghosts would continue to haunt him until they were faced head on. This was the wisdom behind the novel. Shyam Selvadurai expertly wound familial bonds so tightly that they had the power to transform into a noose. Nothing in this novel is exaggerated – nothing is over stated. The juxtaposition of personal happiness and a painful past is so elegantly presented in The Hungry Ghosts that you’ll see the inherent connection clear as day. Can one be happy when the sins of the past have the power to plague your future? And what if they are not your sins? How then, can you break free, and move on if they follow you like a relentless shadow? If it was not for Shivan’s inherent strength, I believe that the novel would have ended in a very different manner. I could go on and on about this elegant novel, but instead, I’ll highly recommend that you get your copy today. 4 stars for The Hungry Ghosts, and a keen look forward to Selvadurai’s next story. Great review! Have you read anything else by Selvadurai? I loved some of his earlier works as well. And I like the new design of your blog!